Kids Art Station - C.R.A.F.T. Some people call it a kids art station, but I like to call is a creative station! 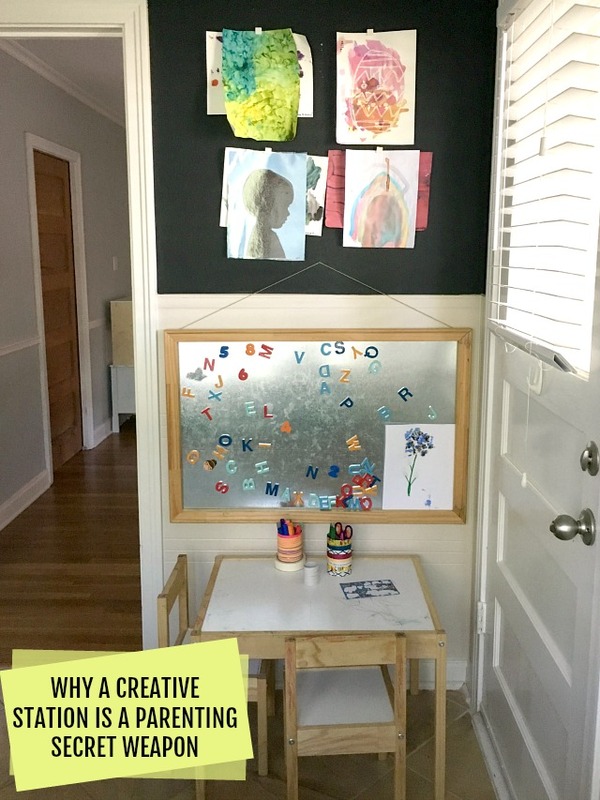 Setting up a creative station is a parent’s secret weapon for encouraging creating in your home. And the best part? Kids can craft independently! Read: You’re off duty! You will be amazed at how often your child chooses to do art when the station is all ready to go. Below is everything you need to know about setting up an art station at home. What Is a Creative Station? A creative station sounds fancy, but it’s really very simple. The goal is to have a designated spot in your home where kids can independently make art at any time. Where does your family typically hang out? Living room? Kitchen? Playroom? Basement? The goal is to encourage creativity, so you want to set up the creative station where it will be noticed and used often. Is there a TV in the room? Ideally the creative station would be in a room without a TV so it does not distract the kiddos from making art. The goal is for the kids to have access to the art supplies at all times. How you organize that is up to you, and likely depends on your children’s ages and abilities and how much space you have to store materials. Tin Can 1: Writing utensils, usually crayons, markers, colored pencils, and/or chalk. Tin Can 2: Hole punch, kids’ scissors, and paintbrushes. 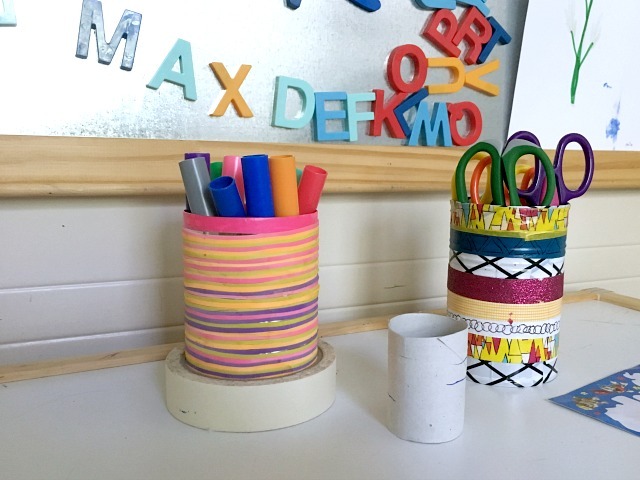 Tin Can 3: Glue, tape, and pipe cleaners. And like I said above, I don’t always have all 3 out at once. I occasionally stick the one with glue in a kitchen cabinet. We also have a paper bin hanging on the wall filled with all kinds of paper: construction paper, magazines, scratch paper, note cards, and colored paper. Pro tip: Call a local architect and ask if you can pick up recycled blueprints. The bigger the paper, the better! There is no wrong way to set up a creative station! As long as you have a nook in your home with a table or easel and craft supplies, your secret craft weapon is ready to work its magic and cultivate creativity. 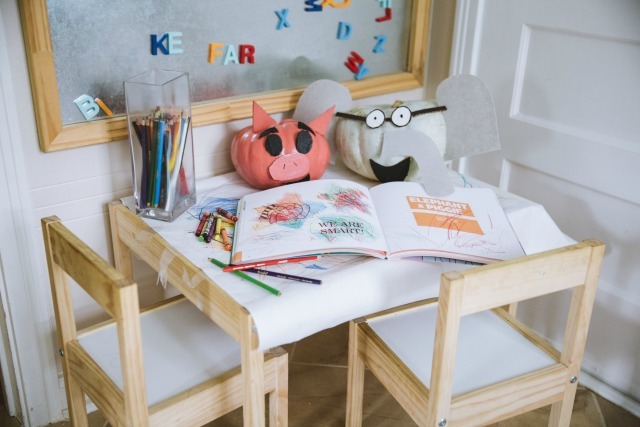 Here is the creative station styled and looking pretty for a photo shoot of the Piggie and Elephant pumpkins. Here is gorgeous creative station a reader, Kristin, set up for her kids. If you set up a creative station, email me pics! The creative station holds only a small portion of our art supplies. We have a kitchen cabinet dedicated to the rest. I use clear plastic shoe bins from the dollar store to stash the bulk of our extra art supplies. Put out only the art supplies that you are comfortable with all of your children using at any time. In my house, this means I don’t put paints out at the creative station—not yet. I want you and your kids to feel empowered by the idea of having art available anytime. 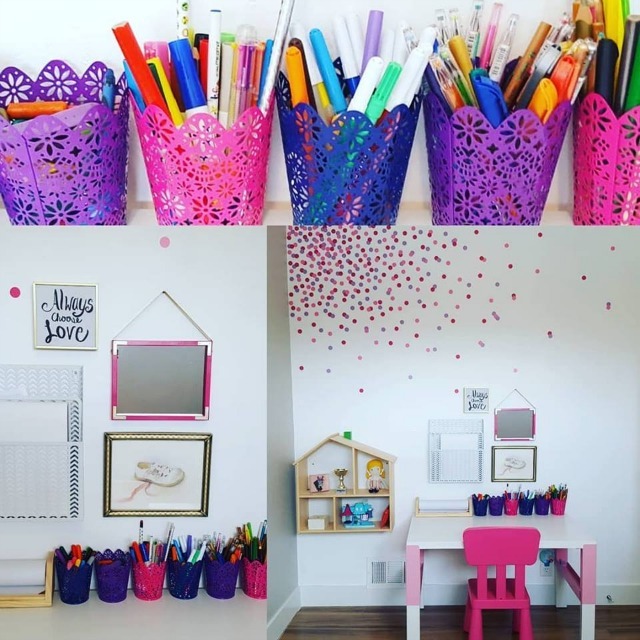 At the same time, I don’t want to scare parents away from encouraging creativity in their home because of making a mess. 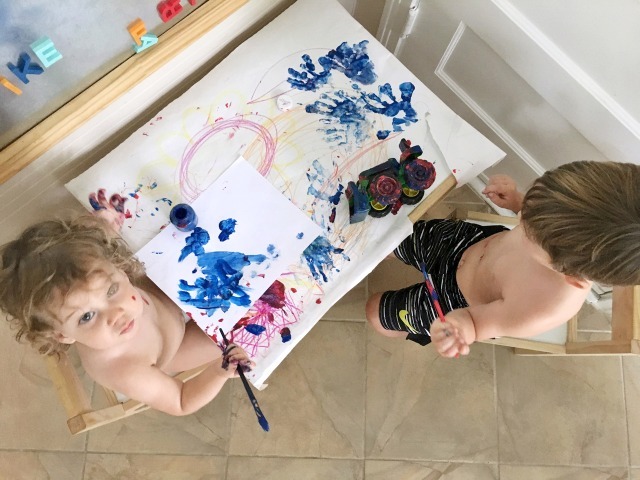 So, if the thought of letting your kids go wild with paint gives you a heart attack, I’m here to reassure you that it is okay to reserve painting for messy art days or the backyard. There are an endless amount of things that you can create with that do not have to involve paint. For example, chalk on dark-colored paper is always a winner! Whether you decide to leave paints out or not, having a conversation with your kids about your expectations is essential. You can’t expect a child to know what not to paint if you have never told them. Art supplies are tools to create, not weapons or toys. We don’t color on the walls. When you’re done, put your supplies back in the tin cans. To learn more about Cultivating Creativity with your kids, sign up for my FREE e-mail course below! Do you have a creative station in your home? Are you going to make one? I’d love to see pictures!